Did The TOC Pull A Fast One? It may not have been the intention of the Thoroughbred Owners Of California (the TOC) to have pulled a fast one on the California racetracks, but the consequences sure makes them look like geniuses while California track ownership and management are looking like pretty bad right now. The track owners and the Horsemen may have actually believed that bettors would be attracted to the move to dirt at Santa Anita, and that bigger purses would attract more horses and create larger fields which would increase handle attracting new money, more than enough to make up for the lost money in reduced churn (a bigger chunk of the existing pie, though their action will reduce the pie even more). The reality is that it still costs too much to own a horse in California despite the purse hike, and not very many outfits are bringing horses to compete there. Trainers charge relatively too much and vets don't help things either. It is speculated on that trainers who charge high prices look for the smallest field they can find so as to keep their win percentages high enough in order to justify their prices (you can't have a 10% win percentage and have too many owners pay $125 in day rate). This culture doesn't change overnight. The wild card is that there has been player push back, speeding up the effects of raising takeout. No one was anticipating this. In a nutshell, the takeout increase has caused blended rates in California to go from around 18.5% to 20.5%. However, the entire increase now goes to the Horsemen. Out of State signal fees could range from 3% to brick and mortar locations to much more when it comes to what ADWs pay. It was admitted that California racetracks could not get the full increase from out of state bet takers, but only a little more than half. Still, if the average signal fee was 6% last year, it means that they are now getting 7%, but when you look at it closer, it means that purses now get 4% on average instead of 3% of every dollar bet on their product from out of state. using this example, which means an increase of 33% over last year (again, I'm not sure of the exact numbers, but this is probably very close). Domestically, from in-state bets, they now receive anywhere between 25-33% more over last year on average. Tracks, meanwhile receive the exact same percentage on every wager, if everything that has been made public is true. In layman's terms, this means that for every thousand dollars bet last year, the track and horsemen may have received $50 each on average (again, this is an educated guess). However, now horsemen receive about $65 on every $1000 wagered, while tracks still get $50. If handle is down 15% because of a combination of the Players Boycott and less churning created by higher takeouts, it means that in relative terms, tracks are now receiving $42.50 on every thousand bet, while Horsemen are still receiving $55.25 per every thousand bet (in adjusted dollars). So even with a 15% drop in handle, something devastating for the track, Horsemen purse accounts will be up by 10%. Now, if you go a step further, the California racetracks could have been actually up this year if not for the boycott and reduced churn. Gulfstream Park and Fair Grounds early success this year may mean that handle might be on the way to recovery. So California track owners are not only down whatever they are down this year, but down what other tracks are up as well. Unless handle drops at least 25% gross over last year, the TOC is unlikely to be motivated to rescind the takeout hike, unless the tracks are hurt so much that they are forced to cut back dates even more (they are currently running only four days versus five at Santa Anita right now), or even worse, threaten to close down. The tracks may have to run only 3 days a week (to cut expenses down), less races (more per day), and a hope for fuller fields to attract more betting per race. Both Del Mar and Hollywood Park have a foot in the grave (well at least a big toe) to begin with. How can this mess be fixed immediately? The TOC has to be persuaded to look into the crystal ball. It is inevitable that things will be a lot worse for horsemen, and whatever tracks remain standing in California a year or two out. There is zero evidence to show that higher takeout leads to more money bottom line for Horsemen and tracks. The tracks have now changed percentages on net takeout, and the TOC would be ill-advised to not consider this when negotiating. The cut on net profits need to be readdressed. If the TOC and tracks are reasonable, the Horsemen should now aim to receive between 55-60% of net takeout received on the California product. This change would be good going forward. As there would now be motivation to make the most net takeout money, which means that the track is free to seek optimal takeout rates. If blended rates don't come back down to at least where they were in California, California racing is at risk of losing Horseplayers who will never return. Most Horseplayers who are boycotting are not interested in anything but a return to the old rates before they will consider betting another race there. C'mon guys and Bo, I want the game to grow. Get together and make it happen. Woodbine's blended takeout rate is approximately just over 21%. 1.3% goes towards taxes. That leaves $200 on every $1000 bet to be split between horsemen and tracks. However, Horsemen get an additional 2% on all bets (4% on triactors), which means that on every $1000 bet on track, Woodbine gets $89 while Horsemen get around $111 on average. If Woodbine drops takeout, the Horsemen get even more of a percentage on net takeout. The HBPA and Woodbine should get together and try to help grow the game, by changing this deal and make it a percentage of net takeout, not a percentage of what is bet. A 55-45% split in favor of the Horsemen on wagers made through Woodbine would not change things one bit, except it gives Woodbine the ability to experiment with lower takeouts. Of course, if Woodbine could find another way to fund the 2-4% the Horsemen gets, they would be free to experiment with lower takeouts as well. Not very many people knew that Fort Erie was even in trouble until early this week, when it came to racing in 2011. They supposedly were good to go for 3 years, but they were not able to make payments for the increased payment to Nordic ($650,000 this year and next, compared to $100,000 last year) and the new HST on time. And they obviously didn't make enough last year to overcome the concern that they could actually come up short this year, and they realized that there is a question of who pays for the shortfall if it happens? Details are not out, but it looks like a deal was carved out that does not place the indemnify the EDTC (the current managers of the track). Still, if they think there is a hope in hell to grow a business with a 26.2% track takeout on exactors and doubles, whoever is guaranteeing the losses is guaranteed to be out money. It starts at the 17 minute mark. You might learn a thing or two. Wager at least $80 in total, win or lose, and you will get $40 deposited into your account. You will also start receiving the industry high Player Reward Bonuses daily as soon as you start wagering. Note: To earn the $40 Bonus you must wager at least $80 in total within 7 days of making your initial deposit. It's good to meet you, Cangamble. But I think airplanes are cool. I like Buddha. I like science fiction. I have a stimulating relationship with Myself. Bet on the ponies. Do you? Oh, so you bet through an ADW? Awesome. Interesting deduction. Next question? Are you what they call a whale? I don't know whether or not I am what they call a whale. Do you bet dollars or bytes? OK what do you want to chat about now?. You could write a whole essay on that question. I think I have written one or two . I am sorry to hear that you are not all knowing. Ah. How do you know? No, I am only partly knowing. Gosh! Why do you want it?. Me? I don't know if I know it. Where would I have heard about it? How about that Ray Paulick? Is he a useful idiot or what? How about it. Yeah. Not if I can help it. Certainly, I have an extensive built-in help system. Maybe Paulick needs your help. Or he will continue to be a useful idiot. I am glad to hear that you are not alone. Anyway, great chatting with you. Bye. Thanks for your support. I like to chat with new people. Goodbye. Steven Crist's latest attempt to empathize with Horseplayers (Bettors Deserve More After Takeout Hike) falls very short in both understanding, and when it comes to offering solutions. He starts off comparing the demise of the NY OTB's versus the takeout raise in California, stating that is could be deemed very surprising that the NY OTB story has virtually disappeared, while the California takeout hike story just seems to be getting stronger. The NY OTB's were in the business of really giving it to the Horseplayer with a 5% surcharge. They killed churn and the OTBs managed to lose money themselves. They will hardly be missed by any self respecting Horseplayer, and in a very short period of time, NY tracks will be much better off. Now, Horseplayers who switched over to ADWs are now getting rewards instead of surcharges. It will eventually become very lucrative for New York racing. Where does Crist get it wrong or not so right? ....the California takeout increase continues to agitate some vocal fans and horseplayer groups, who claim to be laying off playing Santa Anita as a protest against the hikes. Horseplayers groups? Why is the DRF the only horse racing site that has not named HANA (Horseplayers Association of North America) by name? As far as I know, they are the only group that has come out in support of the boycott through the site they sponsor (Playersboycott.org). In fact, they are the only Horseplayers group that I know of. Fan groups are not Horseplayer groups though they include many Horseplayers. ...They have claimed victory, pointing to lower handle at Santa Anita. Who are they, or you mean HANA? And where have "they" declared a victory? A victory would mean that California tracks have rescinded their takeout hike at the very least. Track officials and state regulators dispute the size of the declines and their impact, saying that their lucrative ontrack business has been relatively stable and arguing that the Hollywood Park fall meeting was showing similar declines before the takeout increase took effect. The ontrack business will slide over time as Horseplayers have less to churn. Many will quit or go less. The players least likely to boycott are the homers, and that is completely understandable. But ontrack betting is still down a bit at this time. It will only get worse. Many boycotters I know stopped betting the day Arnold Schwarzenegger signed the bill, therefore Hollywood's meet was most likely affected by the boycott as well. Meanwhile, many tracks that have been giving early reports like Gulfstream and Fair Grounds are up in handle so far. And Tampa Bay seems to be doing quite well too. Equibase numbers for corresponding days in the week from one year to another show declines almost every day at Santa Anita of over 10%. Especially, with a reduction in race days, even with a boycott going, it should be expected that they should be up a little. Not the case. Someone isn't betting the product that used to before. ...It also didn’t help that the two ranking commissioners on the California Horse Racing Board called the old rates “underpriced” and claimed that racing needs to compete with the Lakers and Dodgers, not alternative forms of gambling with lower takeouts. they aren't a very bright or savvy bunch there. Calling any takeout over 14% underpriced is just an attempt to give a reason. The reason comes from people who just don't understand their business. Oh, and if you want to compare the Lakers to horse racing. The takeout on a Lakers game is 4.6%. No one from the tracks or the board has explained the rationale for the nature of the increases or adopted a tone of regret about the supposed necessity of them. This is just badly written. What Crist meant, I believe, is that there was no empirical evidence to suggest that raising takeout would be good for business, and the California boards did not make their decision based on evidence, but gut feelings instead. Their guts were wrong. Officials also could have leavened the increase by at least experimentally lowering takeout on some pools or on new bets. Santa Anita’s sister track in Florida, Gulfstream Park, quietly raised its exotics takeout from 25 percent to 26 percent this year, the same as New York’s and 2.32 higher than the new California rate. But it also put in new low-minimum pick-five and pick-six bets, at respective 15 percent and 20 percent takeouts, and have gotten 10 times as much positive reaction for the latter as complaints about the former. Gulfstream did raise takeout last year on triactors by one point, and on supers this year by one point as well. They almost got away with it without anyone noticing. However, it appears they may have lowered their blended takeout hike overall by introducing the new 15% Pick 5. What California did was increase blended takeout by about 9% (Based on every $100,000 bet last year on California product Horseplayers stands to lose around $20,000 this year as opposed to just over $18,000 last year). It wasn't Santa Anita's mandate to keep the blended rate the same, which is what Gulfsteam's mandate seemingly was. Throwing bettors a bone of a bet type with a lower takeout while blended rate goes up is totally unacceptable, and Crist should know it, and not encourage it. The fan groups have their heart in the right place and are correct in arguing that takeout increases are always counterproductive because they provide at best a short-term bump before the inevitable plunge due to lower churn and customer dissatisfaction. Fan groups? Huh? Again, Crist didn't write this very well (he might have a career in blogging though). What he meant was HANA has their heart in the right place. And when he talks short term bump, he means that tracks have historically seen a slight bump in revenue (profits for tracks and horsemen to split) before takeout increases cause revenue to slide. Still, their efforts to make a statement have been blurred by a haphazard call to action: It’s unclear when they wanted people to send a message about the issue, what pools they were targeting, and what specific countermeasures they would like the tracks and state to consider. Did Crist even attempt to contact HANA? Did he read the specific solutions that are on the Playersboycott site? 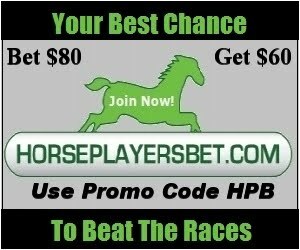 So is Crist really saying that HANA has done a terrible job at pointing Horseplayers and the industry to the Playersboycott.org site? Because the answers to all his blurriness can be found there. It does little good to keep lecturing people about how the optimal takeout rate is somewhere between 8 percent and 12 percent. There is zero chance that any track in California – especially in the absence of any hope for racetrack slots, which are going to begin in New York later this year and will probably come to Kentucky eventually – will reduce its takeout revenues by 50 percent in the hope that handle will double. These lectures are an attempt to educate racing execs and horsemen groups about their product (betting). Hialeah recently dropped all wagers to 12%. Unfortunately, the largest ADW, Twinspires, refuses to put them on their betting menu, probably in hopes that the takeout increase will show mixed results at best. It is the hopes of those lecture about optimal takeout (which includes me), that the horse racing industry will edge towards them like Tampa Bay has, and not away from them like California has. Calling this educational process to be of little value is really mind numbing coming from Crist who professes to be a bettor's friend. What the tracks can do, however, is better explain their plight, rejigger the rates, and give something back to the players in the form of new and cheaper bets. It would at least be a start to telling those customers that they are heard and they are valued. Tracks have done a great job explaining their plight. It is just the solutions they pick to try to fix their plight are just plain dead wrong. New bets aren't important, but cheaper bets are (and I don't mean the price of the ticket but what the takeout rate is). I still recommend Crist's book Exotic Betting. It is very helpful to bettors. His latest article however was not. I don't know what is going on with Horse Racing journalism these days. Yes, I understand that advertising dollars are hard to come by, and these publications don't want to upset the breeders, tracks, etc. that advertise, but it seems like responsible journalism can be found more on blogs these days. First, you have Ray Paulick buying into nonsense that the perpetrators and supporters of the takeout hike want him to believe. At least he does some interviewing. Then you have Crist who did what appears to be very little interviewing or investigating before writing about the motives of the boycotters. At least Paulick allows commenting, and it enables the truth to eventually win out, and he also has no problem printing that four letter word, HANA. There are lots of excuses out there as to why horse racing doesn't grow, and in fact is in retreat. Online gambling has exploded world wide, while horse racing handle has sunk and continues to sink. Down another 7% last year. The economy? Sure, that might explain a drop off the last couple of years, but what about the 7 years prior to the recession? More and more people now have the ability to make a bet by computer within minutes of turning a computer on. Drugs? Horse racing has always been plagued by having a negative image due to drugs or race fixing. Back in the 60's it wasn't enhancers though, but drugs that caused favorites to become sleepy during the race. Still, drugs in horse racing do not cause current players from betting less. Sure, they may skip races that have a suspected drug trainer in it. But they will still bet the same amount they were capable of betting over time. Bottom line, if drugs were cleaned up tomorrow, it wouldn't create one single Horseplayer, or cause handle to rise. Those who don't be have no idea what Lasix or Bute is, let alone snail or cobra venom. Tote Integrity? Again, this is just an excuse that Horseplayers, who have to lose 18% (when factoring blended rebates) of what they collectively bet. Odds dropping significantly from one minute to post versus the final odds, are just something to talk about. The boogieman named "past posting" is probably so insignificant, that to spend oodles of money to prevent it makes no sense whatsoever. Don't get me wrong, if horse racing is to grow, tote integrity will matter, but it doesn't matter right now. There are flaws in the system, and most will be corrected by the new TRPB initiative, however, this will not create new Horseplayers or increase handle over time one iota. Quality? Yes, Horseplayers generally are attracted to quality races (not me though), however, quality by itself will only be a disaster for the industry. Small outfits are the backbone of the horse racing industry. And think of a game where only the best horses get to race? What happens to breeding? Less horses by far. What happens to horses that decline? Early retirement. It is hard to keep a quality horse population up when fewer will be bred and there will be a huge shortage of owners as well. Not only that, but governments will stop giving horse racing any incentives or allow the game to be subsidized by other forms of gambling because the industry will not have that many jobs in it anymore. By increasing the quality or getting rid of the "bad" horses, there would be even less Horseplayers today, as small owners bring friends to the tracks, and that creates growth, small tracks create some Horseplayers as well. The fact is that movie Secretariat and Zenyatta's quest for immortality didn't create one single Horseplayer (so it seems), tells me that quality will not save the game. Another thing when it comes to quality, most horses bred today have a lot of royalty in their blood line whether they races at Santa Anita or Beulah Park. Drugs probably hurt the quality aspect more than anything as they seem to cause horses to race less, and even injured earlier by raising the bar on how much faster a horse has to be today in order to compete. In order to optimize purses, an optimal takeout must be sought. Every academic study done on this topic suggests that this takeout should be no higher than 14% and probably as low as 8% for WPS at least. Another important read is an article on Mike Maloney, someone who bets on horses for a living, he also a VP with HANA. In the article, he repeats my constant message, that winners need to be created in order for the game (though Mike doesn't mention it, he means winners who don't get rebates). Horse racing needs a Chris Moneymaker. And that is impossible when the blended takeout rate is over 21%. Another interesting point made by Mike was that takeouts were lower when horse racing was virtually a monopoly. What other industry increases their prices when they are forced to compete? He also explains that takeout matters even though most people are not cognizant of takeout. Great read. Bottom line, drugs and tote integrity, etc. are just excuses for why a Horseplayer temporarily loses money, but it is inevitable for them to lose money collectively, so there will always be excuses. Sure, it would be nice if the only excuse they can use is I'm not that good of a handicapper and/or bettor, but no matter the excuse, collectively they will lose. The important thing when it comes to growth of the game is how fast they lose. The quicker they lose, the least likely they are to come back. The more likely they are to find other hobbies. The longer they last, the more likely horse racing will become a priority in their life, and they have the capabilities to expose their friends and family to the game. To hook new players quicker, it would help immensely if we had a few Chris Moneymakers as well. Who Contributes More To Horse Racing? The Horseplayer Or The Owner? Tackling the second statement. No, the track puts on the show, and the show is gambling. The proceeds from gambling losses by customers make the race track and the purses it gives out tick. It is estimated that thoroughbred horse owners collectively lose 40% of what they put in ( for some jurisdictions that have slots, this amount may be lower, while owners in jurisdictions that don't have subsidized purse money added to purses may lose more). In 2009 $1.1 Billion was distributed in purse money. After owners give 10% to trainers and pay the jockeys their share, that leaves around $900 million that goes to the owners. 40% of that is $360 million . Sounds like a lot, but it is pale in comparison to what Horseplayers lose. EDITORS UPDATE: Turns out that the number lost by owners could be closer to $1 billion, but if you take into account that Horseplayers lose after tax dollars, and much of the lost money for horse owners is pre tax dollars, the amount that Horseplayers lose in real money is much greater than what is lost by owners collectively. $12 Billion was bet (I'll stop short at calling this money invested, though horse owners like to use that term for the money they gamble on owning horses). The blended takeout rate is around 21%, but because of rebates the blended rate is probably closer to 18% these days. This means that over $2.1 Billion is lost each year by Horseplayers. And if you include the lost money by gamblers at games like slots or Instant Racing, monies that are used to subsidize purses, gamblers/Horseplayers lose a lot more than $2.1 Billion each year. I'm not even going to add the costs of Forms, data, transportation, admissions, and concessions (much of which owners can deduct, but the 99% of Horseplayers who lose money cannot). Now, if we dissect the $360 million lost by owners further, almost all of it is lost within the industry, and a good amount of it goes to horse owners who have a horse racing related business on the side (like farms that break horses, etc. ), or even a full time business (like a vet who owns horses). Some of it in the form of day pay goes to trainers, which helps subsidize the horses they own or co-own. Another thing is that in many cases, horse owners only risk a small percentage of their whole net worth, while in many instances, Horseplayers are risking their entire net worth...in some cases, the Horseplayer doesn't have a positive net worth. So who exactly is more important to the racing industry? Those who lose less than $360 million $1 billion a year (mostly pre-tax), or those who lose more than $2.1 Billion after tax dollars? Why does horse racing cater to owners and not Horseplayers? That is the bigger question. California is now a disaster thanks to putting the horse owner first. And why again do horse owners have such a major input in the price the track charges the customer? "If there isn't any gambling, owners lose a lot more. If there isn't any gambling, gamblers lose a lot less." • A 50 cent Pick-5 with a record low 15 percent takeout. • Low takeout rates on Bet-3 and 50 cent Pick-4 wagers of only 20 percent. • An early and late 50 cent Pick-4. • A 10 cent Pick-6. • Rolling Daily Doubles, Superfecta’s and Bet-3’s. There was a link in the rest of the article which gives takeout info on Gulfstream. I clicked it. The first thing that struck me was seeing 26% on trifectas and superfectas. I could have sworn they were 25% last year. It turns out I was wrong. They snuck in an unpublicized takeout hike of 1% on tris at the beginning of last year. This year, they have snuck in a 1% increase in superfecta takeout. So what about "record low takeouts" that are being advertised on their site and being bought by the racing media? The new pick 5 doesn't count as a takeout drop because it is a brand new bet. And it isn't a record low at 15%, it ties the record set by Monmouth Park. The Bet 3 and Pick 4 rates of 20% are the same rates they had in 2010. I don't see record low takeoutS, I see one tied record low and that is it. However if you look at the new Pick 6 which now resembles the Beulah Fortune 6, the nature of the bet has changed, and the takeout has gone up 33%, from 15% last year to 20% this year. Depending on how successful the Pick 5 bet is, it will be a coin toss as to whether their actual blended rate goes up slightly or down slightly or remains around the same. Yes, the Pick 6 has a shot of bringing in the lottery/slots crowd if the jackpot grows once or twice during the meeting, but to promote Gulfstream Park as a track that has lowered its takeout is just plain deceptive and wrong.